Upper St. Clair is divided into 5 Wards and those Wards are further divided into 18 Districts. The boundaries the wards and districts were established through the Township Charter. The Township has a map of the Wards and Districts. 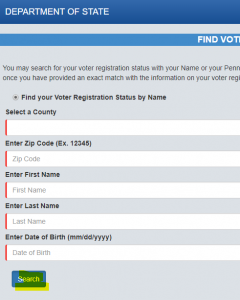 The easiest way to find your Ward and District is on the Pennsylvania Department of State Voter Registration Lookup. There you can enter your name or driver’s license number and find the Ward and District along with your voter status and polling place. After “UP ST CLAIR” the Ward number is listed first, and then the District. In this example, the Ward is 2 and the District is 1, which is referred to as Ward 2-1.